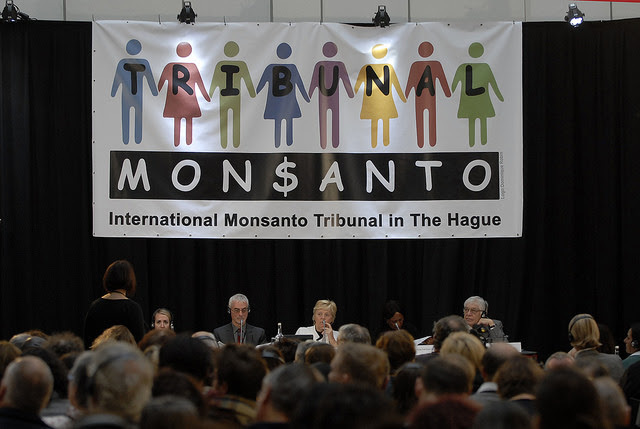 The Monsanto Tribunal is an international civil society initiative to hold Monsanto accountable for human rights violations, for crimes against humanity, and for ecocide. Eminent judges heard testimonies from victims, and will deliver an advisory opinion following procedures of the International Court of Justice. A distinct and parallel event, the People’s Assembly, was a gathering of social movements from all over the world that exchanged ideas and planned for the future we want. The Tribunal and People’s Assembly took place between 14 and 16 October 2016 in The Hague, Netherlands. The Tribunal was hugely successful, 750 people from over 30 nationalities participated in it and the related People’s Assembly. Eminent judges heard from witnesses, experts and victims about Monsanto’s abuses. Soon, the Tribunal’s advice could really be putting Monsanto in the spotlight — at the UN’s International Court of Justice.